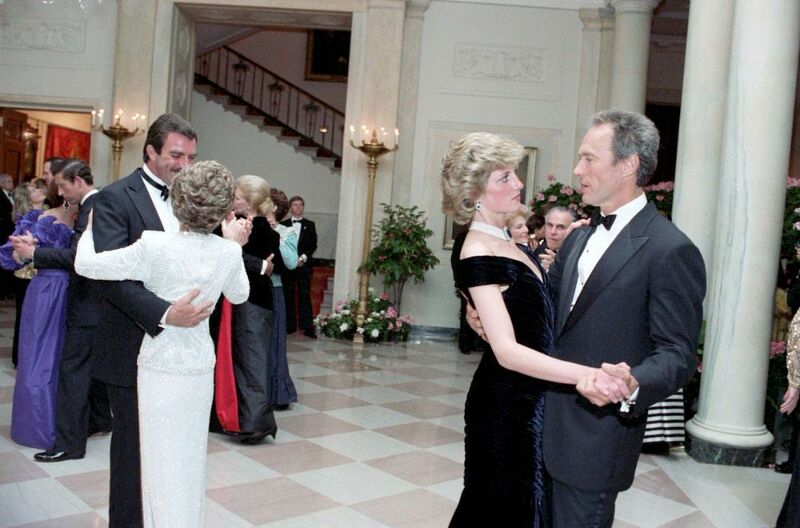 When Princess Diana visited President Ronald Reagan and his wife, Nancy, at the White House in 1985, she stepped onto the ballroom dance floor — with a man known for his electrifying moves on the big screen. 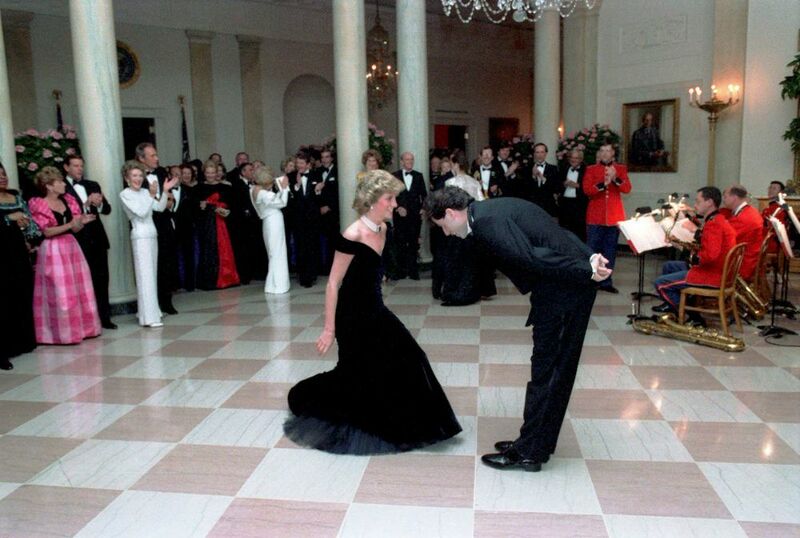 Diana took the hand of John Travolta, star of Grease and Saturday Night Fever, and the pair gracefully spun around the checkered floor for nearly 30 minutes. 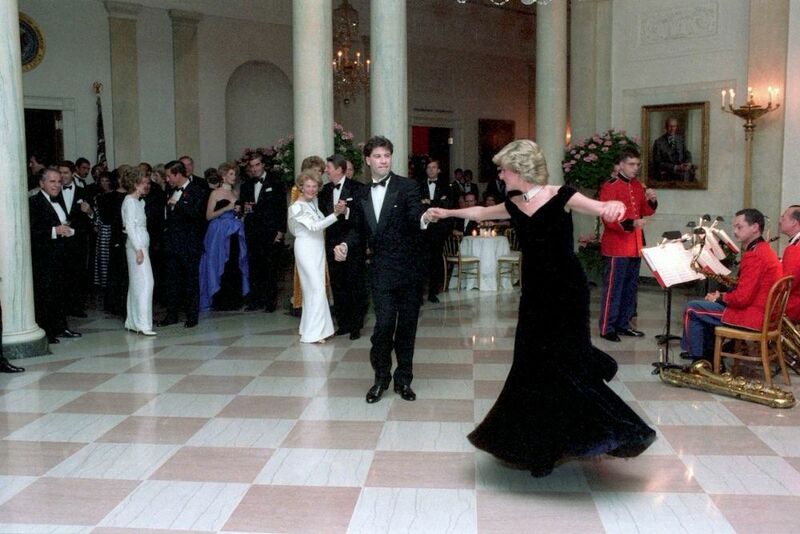 The dance would become one of the most iconic moments of her life — and the velvet dress she wore for the occasion instantly assumed its place in her hall-of-fame looks. Designed by London-born Victor Edelstein, the “Travolta dress” is an off-the-shoulder midnight blue velvet evening gown. It was inspired by Edwardian fashion, giving it a “slight sweep of costume drama”. The journalist Jackie Modlinger described it as “dramatic in style” and “regal in fabric”. 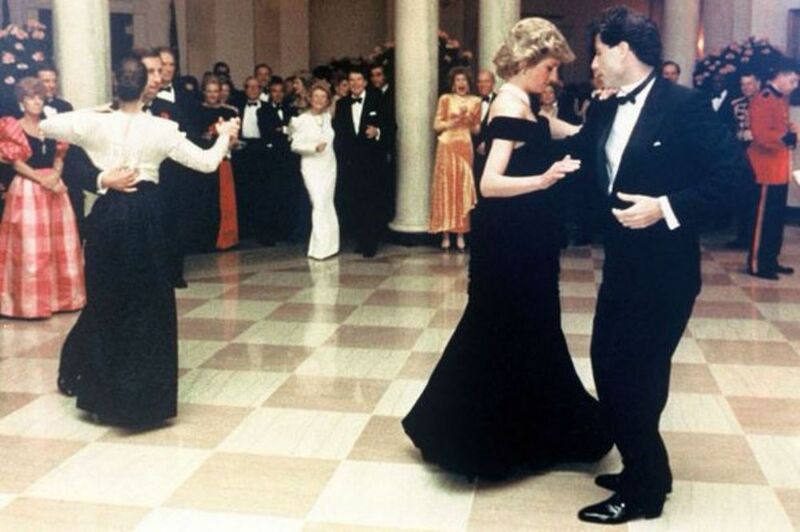 The Princess of Wales wore the dress again in Germany in December 1987 and at the premiere of the film Wall Street in April 1988. She wore it for her last official portrait photograph, taken by her former husband’s uncle, the Earl of Snowdon, in 1997. 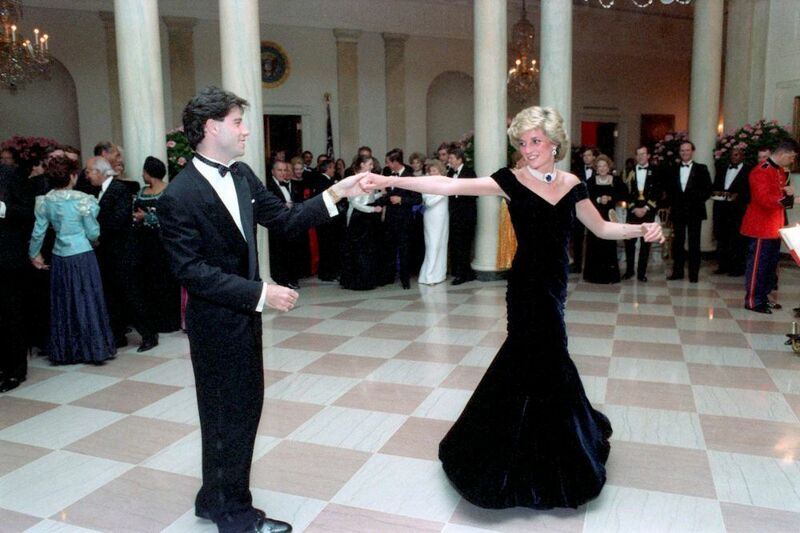 Shortly before her death in August 1997, Diana requested that the dress be sold in a charity auction. Florida-based businesswoman Maureen Dunkel bought it for £100,000 in New York in June 1997, along with nine other dresses formerly owned by the Princess. The Travolta dress was the most expensive one sold at the auction. When she went bankrupt in 2011, Dunkel was forced to put them up for auction, but the Travolta dress was one of six that were not sold. It was finally auctioned off by Kerry Taylor in London on 19, March 2013, fetching £240,000 ($362,424) and again being the most expensive auctioned dress. It was bought by “a British gentleman as a surprise to cheer up his wife”. 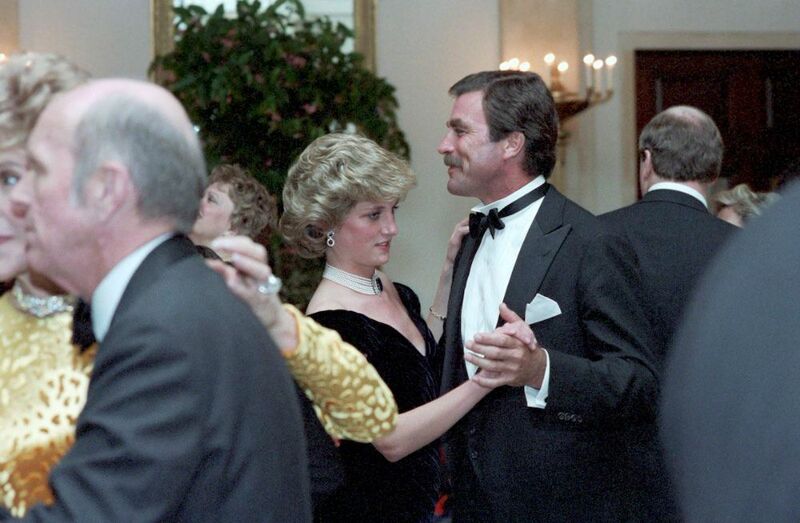 During the gala, Princess Diana also taking to the floor with Tom Selleck and Clint Eastwood on that glittering night at the White House in September 1985. 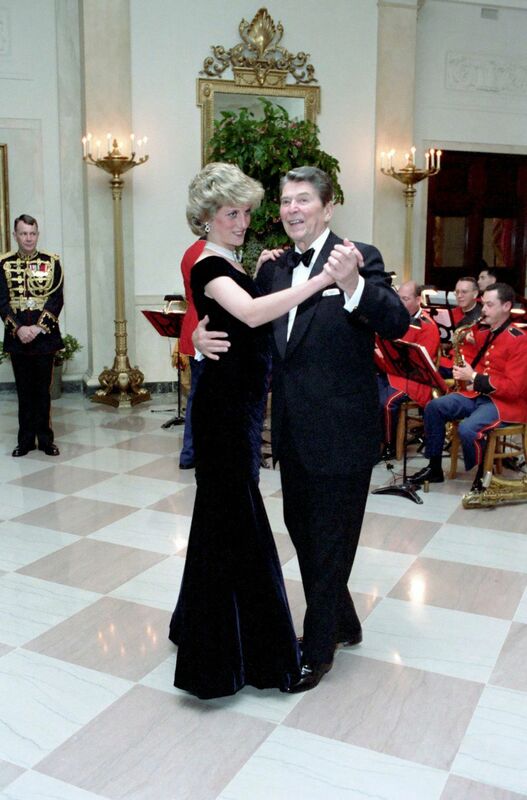 Diana dances with then-President Ronald Reagan.